The father of Blade skis and Guicarflex race plates is Filippo Carpani who started a new ski product line in 2008 called CARPANI. Legendary among race and race carve enthusiasts in Italy, Filippo's skis are painstakingly made by hand with raceroom technology and highest quality materials. Besides race-ready SL, GS and specialty skis, Filippo has been making stunningly beautiful custom skis for clients who want racing technology wrapped in highly polished, exotic woods and metal accents. Filippo is one of the EU's legendary ski makers with a fanatical following. "Model designed and developed for competition and bounds. The particular design of a sandwich construction combined with the system Activa Race gives this ski a high stability and propulsion output curve. The system Activa Race on this model is designed to dampen vibrations on hard and rough typical of competitive giant. So for those who do not want to compromise and wants a racing car model F4 it is the ideale.Novità QUICK TIP tip"
Note: This F4 model is no longer offered, but is replaced by the Carpani F4 Activa Race Master in 2017-2018, with new carbon fiber and flax fiber components. Suberb fit and finish, heavy-feeling with X 12 bindings and race plate. Textured poly topsheet with vibrant graphics. The Italian Carpani F4 Soft Race is a true thoroughbred competition GS ski handmade to order by Filippo Carpani, a master ski builder with a cult-like following throughout Europe. 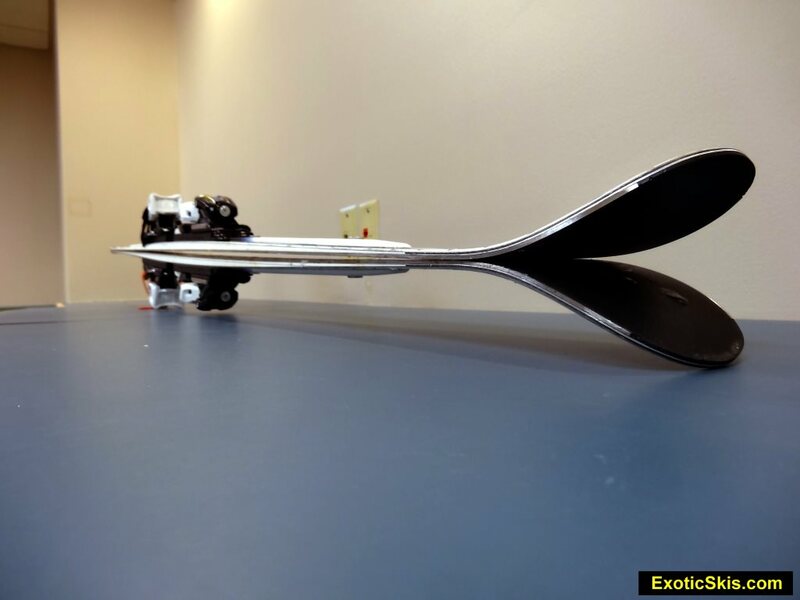 Filippo will customize the flex of this model to your specifications for an additional fee, and provides various models with different shaping and construction to meet various demands of his clients. For €599 , it's a great bargain if you want a small-run, hand-made race ski with Italian heritage. 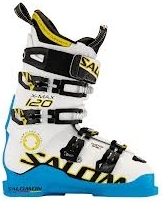 This "Soft" version is more skiable by mid-to-lightweight skiers than the full-on FIS race version and can be used for recreational technical carving on hard surfaces as well as GS racing. This version did not have the "Activa Race" arm attachments offered by Carpani. The F4 Soft Race is a true technical GS tool with high-precision, dampened handling and super control at speeds. It takes a bit of speed to get the F4 Soft to engage enthusiastically, but much less than the full-race version of the F4, making it ideal for younger racers or lighter race enthusiasts. Tracking behavior through gnarly, hard surfaces is superbly quiet and controlled, with a strong, but not overwhelming acceleration at the end of the turn if you load the ski and release it. The Carpani F4 Soft Race is a great ski for aspiring racers or lighter racers who need control and accuracy to improve their technique and results more than pure power and acceleration. The Carpani F4 Soft Race has superb grip and quiet feel underfoot on boilerplate and icy conditions, some of which is attributable to the damp raceplate installed on this test ski. Tracking grip is consistent and reliable along the entire pressured surface of the ski on-edge across hard terrain, with performance on-par with any offerings from the larger race ski brands from Rossignol, Fischer, Head and others. Vibration control is excellent, owing much to the titanal construction and choices of core materials Filippo uses in his skis. The Carpani F4 is an excellent race-surface weapon, even in its "soft" flex construction option. We did not ski this model in mixed conditions, but did spend a few runs on packed powder and corduroy surfaces and found its narrow waist and damp stiffness a bit limiting if the ski could sink "into" the surface rather than edge on top of the surface. It really shines on hardpack and belongs on top of a racing-quality surface. It can be superbly effective at cutting through somewhat choppy conditions or tracked-up packed powder conditions, but is really not suitable for anything deeper than an inch or two. If you want an all-mountain race carver, look elsewhere. This is a GS racing machine, much like its full-on F4 Race Activa sibling. A professional race car set up for civilian enthusiast drivers. First impression of firm butter, these love to turn and will rocket you from one high speed arc to the next yet, iif you find yourself in the backseat, they don’t heave you out of your line like many race stock skis can do. The tails have a nice progressive flex, you can still use them… hard, but they are not unforgiving. They go fast! My GPS was at a solid 100kph, a little over 60mph, on a firm, sunny, empty day. They are solid. I specifically chose steep, firm pitches at speed, making tight turns, a very technical GS, and had no chatter. Feels clamped into the surface. Wants speed to engage, but takes little pressure to begin the trajectory. Requires a wide-open slope early in the morning without skier traffic to really let it rip and ride the full radius in both directions. Rewards the pilot who holds and increases pressure throughout the turn with rock-solid tracking power and acceleration. Can be broken off-line and drifted sideways without being hooky, grabby or scary. Feels attached to the snow, not heavy while skiing. Needs a well-disciplined, technical expert to really use everything in this ski, but can bring a mid-level racer up a notch if they need a quieter ski with softer flex for their weight. The Carpani F4 Soft brings high-end race ski abilities down to ligher and mid-weight racers without sacrificing true race performance. This is a softened race ski, not a recreational race-carver. Be prepared to alter the thickness and type of raceplate and flex specification to meet your particular technique. This ski can be built with customized flex by Filippo Carpani.